Jamie Hill insider her 25-foot bus, Wanda. The differences between St. Louis and Highland, Illinois, are obvious. 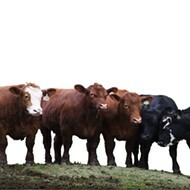 About 40 minutes east of St. Louis, Highland sprawls north-south between I-70 and Highway 40, with mom-and-pop businesses dotting the two-lane route that runs alongside fields of corn and soybeans. It's charming, but it's quite a contrast to St. Louis' Soulard neighborhood, where cafes, shops, historic homes and bars crowd together in a walkable district known for the Midwest's best Mardi Gras celebration. Jamie Hill has spent time in both, but she has no interest in putting down roots in either. "Some people like being in their house, and that's fine," Hill says. "My whole thing is, I want to explore and get out." That need to "get out" is why Hill heads to a Highland auto body shop every day and tinkers on the 1984 GMC school bus that she's converting into her new mobile home. A 27-year-old bartender who grew up in Silex, Missouri, Hill had lived in a Soulard apartment for several years, but grew tired of paying high rent and limiting her travel time to days off work. 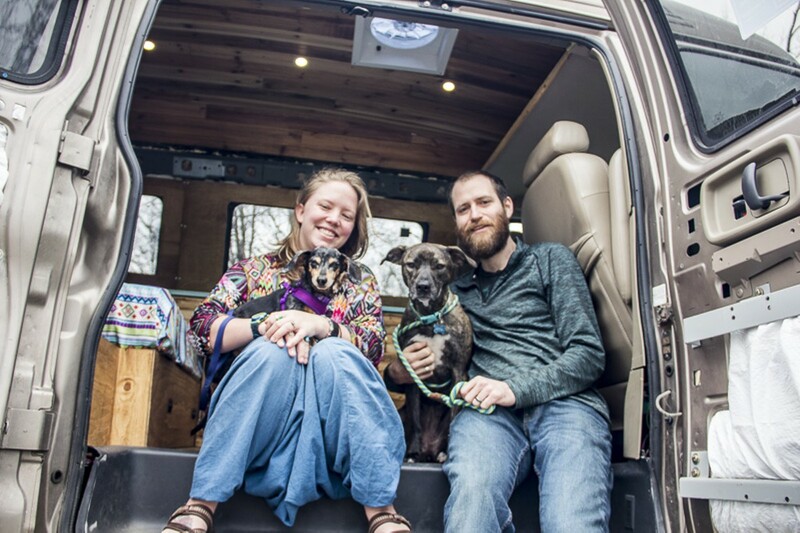 Taking monthly weekend road trips with her beagle Lucy to Phoenix, New Orleans and parts of Arkansas, she realized that she needed to make a big change if she was to be truly happy. "I started getting sad about coming home!" she laughs. "I wanted to be out permanently and just go — to have the freedom to go and live. 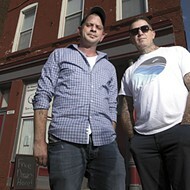 I knew I wanted to get out of St. Louis, but I didn't know where I wanted to go." 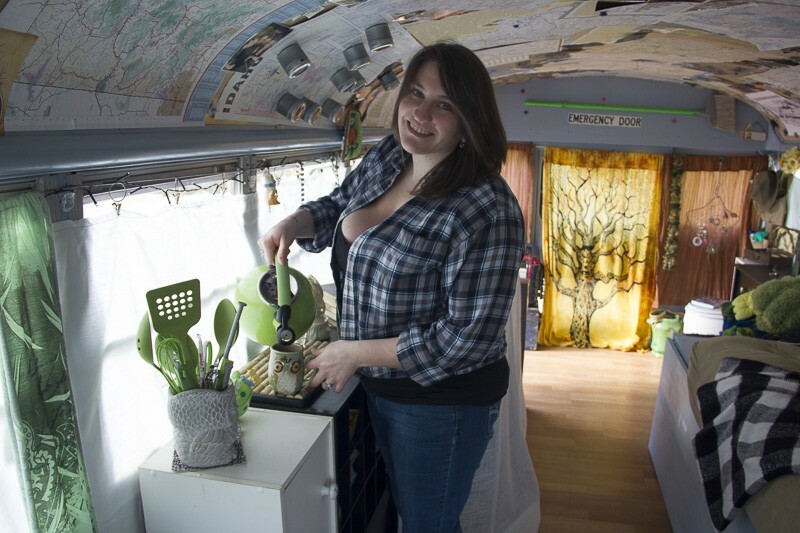 After deciding two and a half years ago that owning a bus was the answer to her dreams, Hill joined a number of social media groups about bus living and began researching options that would work for her and Lucy. Not long after that, she found it: a short bus in decent condition had just been posted to Craigslist, and it was just $2,000. "I think I looked at it three times and kept thinking, 'Man, this is a really big deal. What am I going to do with it after this?'" Hill says. "Finally the dude was like, 'Are you gonna buy it? Or are you just going to keep bothering me and looking at it?'" Thus, Hill became the owner of Wanda the bus, named for both a character on The Fairly Odd Parents and the daughter of national park advocate John Muir. 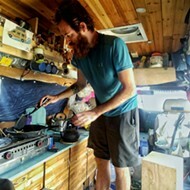 But unlike John and Jayme Serbell's conversion van, Hill's 25-foot bus — a mid-sized model that those in the know dub a "shorty" — was already on its way to livability when Hill bought it; the seller had ripped out the seats, installed laminate wood floors and put in a new motor, planning to try nomad life himself. "He wanted to take it to Sturgis [South Dakota], and I asked, 'Well, why aren't you taking it now?'" Hill remembers. "And he said, 'I invited like seventeen people and it's not big enough!'" So Hill drove Wanda to the home of her boyfriend's pal, where she and her mechanic brother worked on it, changing the motor to one more suitable for frequent shifts in elevation and building the cabinets and fold-out bed frame. 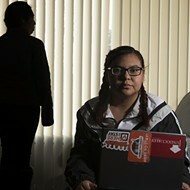 She took advice from her school bus community friends — who call themselves Skoolies — and researched solar panels, lighting and even a dry-flush toilet, which runs on its own battery and vacuum-seals waste until it can be taken to a proper receptacle. She regularly shares her work on her blog, Trips With Wanda Jane. And that's when things went sour. Hill says that her boyfriend and his friend got into a heated argument — and the former pal took things out on poor Wanda. Jamie and Lucy map their upcoming bus adventure. "I came out one day and the starter was off, the battery was out, the tires were flat. He put metal shavings down in the block. Just a horrible human being!" Hill says. She had the bus towed to her brother's house in Wright City, Missouri, and made the best of the situation by adding a fuel-injection system. Once they improved what they could, Hill drove Wanda to a trusted auto shop in Highland, where she and mechanic friends have been slowly working on it since. Hill and Lucy currently live with her boyfriend near Highland, which makes it easy to visit Wanda every day and prepare her for the road. 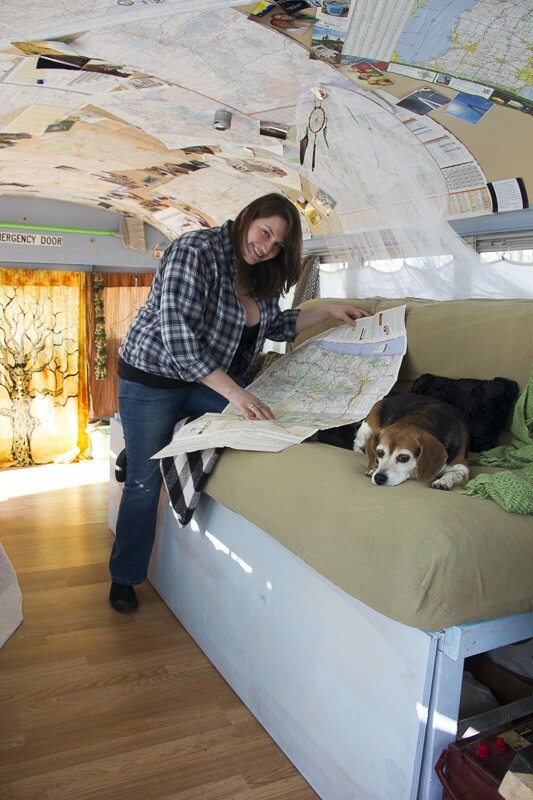 After putting in about $12,000 worth of bus improvements, she's learned more about wiring for electrical systems and maintaining her new engine and feels ready to take care of things on her own once she and her pooch hit the highway. "You see so many people building buses and vans, and they have a lot of skill to do it," Hill says. "I want to be the person who doesn't have any skills but knows that it's OK. Like, it's cool, everyone can do this if they wanted." Hill's biggest desire: to visit every national park in the United States. She plans to start traveling as early as next month, hoping to work-camp in state parks and private campgrounds in the northern part of the country for several months and then do the same in the south once the weather cools. She may pick up bartending shifts in towns along the way for extra cash. But she doesn't want to return to a traditional job or a traditional life. "It gets into you and you're like, 'I'm building a house! A whole house!' And I don't know if I ever want to live in four walls again," Hill says. "I always tell my mom this is my starter bus and I think eventually I might get a bigger one." "I kind of just want to live unconventionally forever. Maybe I'll buy a piece of land with a porch that I can drive up to, you know?" 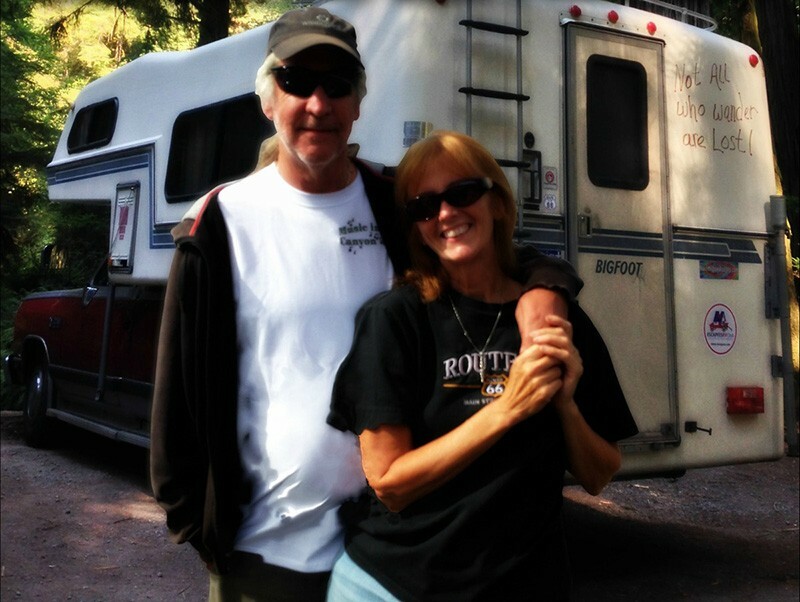 Trisha Barnes and her husband Bruce have been traveling the country in a camper since 2010. Trisha Barnes knew she was a camper since she was a young girl in Boonville, Missouri. She just didn't know that it would become her primary way of life, thanks to a lot of faith and a little bit of luck. "I truly believe that when you have a desire — and a strong desire, a dream that you just won't let go of — the universe puts things in motion to deliver what you need," Barnes muses. 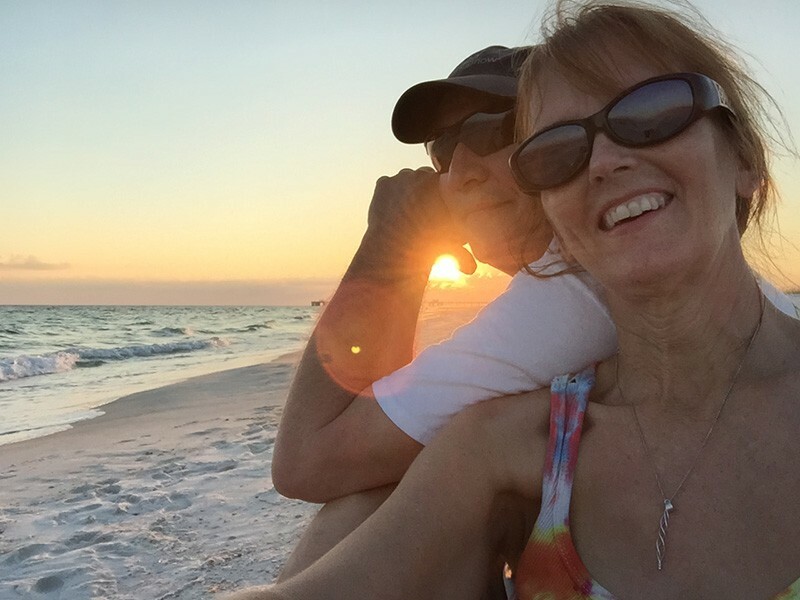 Barnes, 61, and her husband Bruce have been living their dream of being house-free and traveling the country in a truck with a camper since 2010. 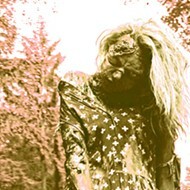 But long before Bruce entered the picture, Barnes was laughing with her siblings and cousins in a massive homemade camper during the summers of her youth or camping with her parents at hotspots in southern Missouri. "Mom and dad slept in the pop-up camper, but we slept outside on Army cots," Barnes says. "I remember that it was so special and fun to be outside like that, to sleep under the stars. So there have always been a lot of seeds planted." Those seeds sprouted into a happy life of wanderlust once Bruce walked into her life. 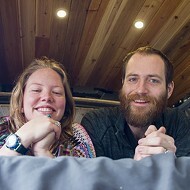 Along with enjoying married time together in a duplex, the couple shared a dream of one day experiencing the RV lifestyle. They had no idea when they might buy such a vehicle — "When the time's right," they said to everyone who asked — but they believed that everything would line up eventually. In the meantime, the couple packed up their Mustang convertible and went camping every weekend, enjoying the tent-side view of nature. When the lease for their duplex was up, Bruce suggested that they move full-time into their tent. "I was still working in a corporate job where I wore skirts, heels, make-up and all that stuff. And I was just thinking, 'How in the heck do you think I'm going to go to work from a tent?'" Barnes laughs. "But then we found this little campground in Columbia. It sat right on the Missouri River, and they had a shower house, electricity in the shower house, a washer and dryer, and I started thinking, 'I think we can do this. 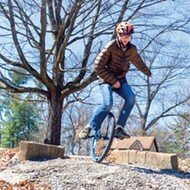 I think I'd be OK.'"
After a successful summer in the tent, the couple moved back into an efficiency for the winter, but before long, Barnes' favorite campground called to ask if they wanted to come back to the campsite as hosts in return for camping space. There was just one condition: They needed to have a camper, not a tent. With limited funds and no loan backing, they were ready to pass when one of Barnes' co-workers mentioned that he had a camper for sale at a price they couldn't refuse. "He sold us a pick-up with a camper on it and financed it himself with zero interest on it!" Barnes marveled. The couple's monthly payment: $100 less than what they'd been paying for their apartment. 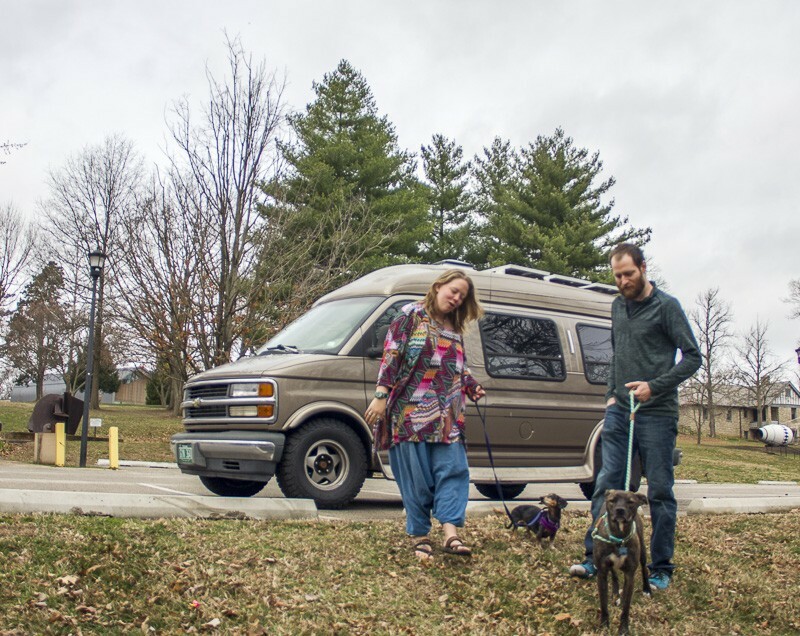 Trisha Barnes and her husband are looking to downsize to a conversion van. Barnes and her husband moved to the campsite in their new-to-them Dodge Ram/Bigfoot Camper combo, welcoming nature lovers and drawing crowds to their weekly Naked Hippies barbecue and blues events (fully clothed, despite the name). After a few years, they were ready for the next step in their cross-country dream. Barnes look another leap of faith, finally quit her corporate job and let coin tosses guide their routes. 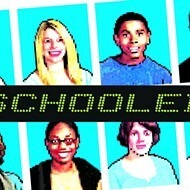 "People think they need to have all this money saved up and everything lined up perfectly. We just go. We had enough gas money to make it to our friends' home in Arkansas," Barnes remembers. And despite a few bumps in the road, they haven't stopped traveling. 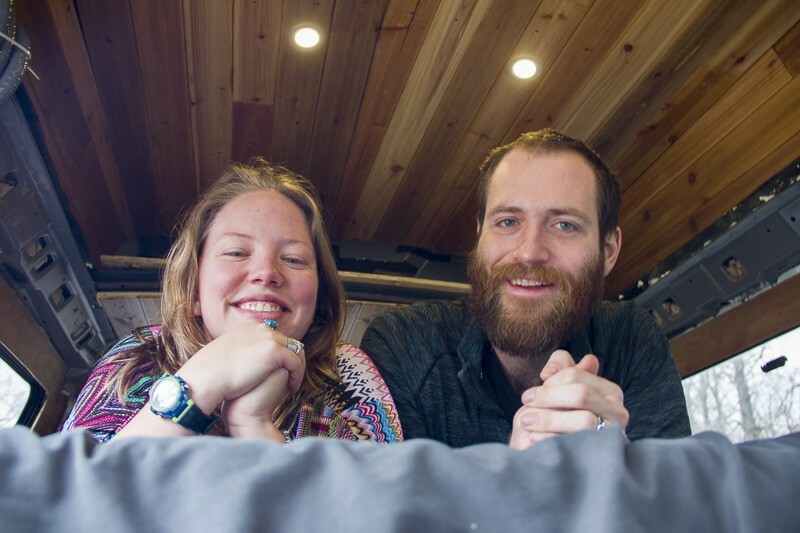 With income from odd jobs, their online marketing business and blog at nakedhippiesroadtrip.us as well as royalties from Barnes' 2016 Amazon bestseller RV Living: The Naked Hippies Way, the couple makes enough to finance their nomadic lifestyle while inspiring others to realize their own dreams of freedom. For Barnes, that's enough. "I had been interviewed about our lifestyle, and the lady asked, 'Trisha, how will you know that you finally did it?' And I said, 'When I stand in the redwood forest,'" Barnes says. "It gives me goosebumps right now. You see the pictures and imagine how beautiful it is, but until you stand there on that ground, you don't really know." Barnes knows now, though; the couple finally made it to California's Redwood National and State Parks a few years ago, and it was everything Barnes had imagined. "I stood there and cried and just took it all in because it was so amazing," she says. "I was going, 'This is like in the movies!' I was like a little kid, just screaming and excited." But there's still more to see and do, Barnes says. For their next adventure, the couple plans to downsize yet again, trading in their truck and camper for an even smaller vehicle — a conversion van, just like the one John and Jayme Serbell are taking on the road this month. 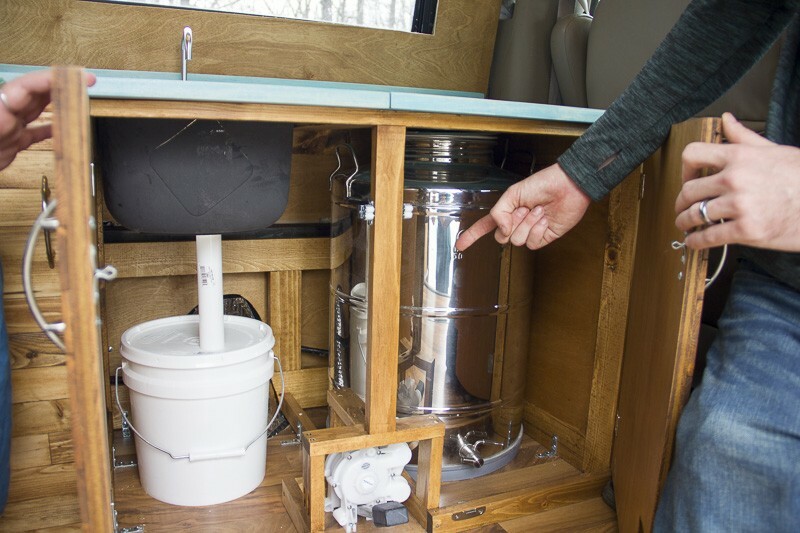 "It's even more simple living than what we have in our camper, because in our camper, we have a stove, a refrigerator, a freezer — all of the amenities," Barnes says. "And when you ask me when we're getting it, it's the same answer as when those people asked when we would be getting an RV," she says, laughing. "'When it shows up.'"